If any historical figure deserves to be the subject of a biopic, it is Rev. Dr. Martin Luther King Jr. A myriad of reasons have delayed and ended attempts to depict his life on the big screen, but now, Director Ava DuVernay and producers Brad Pitt and Oprah Winfrey have seemingly succeeded where others have failed. The first official trailer for Selma has finally arrived. It doesn’t take a light or memorializing tone. It doesn’t water down the gravity of the events of the Civil Rights Movement. Instead, it shows the seriousness of the time, the constant immense pressure that MLK had to shoulder, and the monumental obstacles he had to face. The film chronicles the events that led up to the march in Selma, Alabama, also known as “Bloody Sunday,” and the pivotal impact it had on the mid-twentieth century civil rights era. 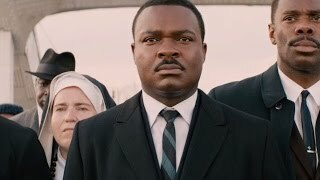 As you might expect, each actor appears to be putting their all into their performances, and David Oyelowo’s take on MLK is stunning. Instead of a Ghandi-like pacifist, MLK lights up the screen as a fiery, determined, and courageous leader. The movie is set for release on January 9, 2015 and stars a “Who’s Who” of black Hollywood, including Tessa Thompson as Diane Nash, Cuba Gooding Jr. as Fred Gray, Oprah Winfrey as Annie Lee Cooper, Common as James Bevel, Wendell Pierce as Reverend Hosea Williams, Niecy Nash as Richie Jean Jackson, and Ledisi as Mahalia Jackson. This is not to be missed.